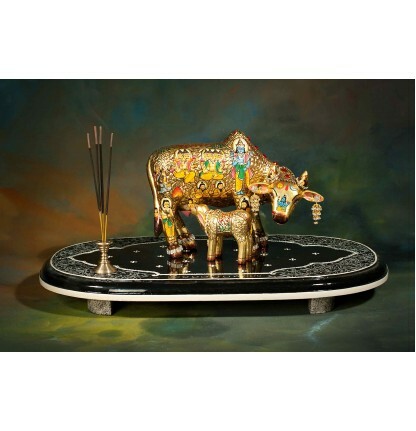 Maa - Kamadhenu: The sacred cow with powers to fulfill any wish one makes. According to ancient philosophies, Emerged during churning of sea between Gods and Demons. It is said that all of the Gods resides in different body-parts of a cow and kamadhenu is the mother of all cows on earth.Our research team spent two months in finding out the exact designs of god-symbols, their postures, placement and colors. Also, it is said that clay, stone, wood and then gold is considered best when going for some devotional idol formation. Hence, we have used both of the top-tier materials. Along with the strong and prominent historic background, this sculpture has an artistic significance too. This kind of an artwork is not found these days. Aesthetically and quality-wise its one of the best art-work you will ever own.